PsycheDillic Sweet & Crunchy Salad - A recipe from Savor California, the online showcase for extraordinary gourmet foods and beverages from California. Whisk first three ingredients together, then slowly add the extra virgin olive oil while whisking until emulsified. Add salt and pepper to taste, set aside. 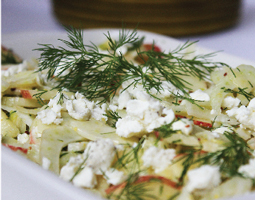 Gently toss the prepared fennel, apple, 1/2 of the crumbled PsycheDillic and fresh dill with the prepared dressing. Crumble the remaining PsycheDillic over the top of the tossed salad.